Neon is a perpetual fashion favorite for summer, but this year, fluorescent-hued clothes and accessories are bigger and brighter than ever. As with most other trends, the easiest way to incorporate neon into your wardrobe is through accessories. Neon scarves, belts, shoes, handbags and jewelry are all simple and inexpensive ways to add a punch of color to any outfit. For this look, start with a summer-appropriate LWD then add a bold pop of color by styling it with a hot pink skinny belt and a matching pair of pumps. A sleek tan clutch mimics the neutral color found on the shoes, while the delicate earrings add a feminine touch. Pairing neon with neutrals is not only a match made in fashion heaven, but also the perfect stepping stone if you’re ready to move beyond neon accessories. Choosing to wear just one piece of neon clothing with a neutral color palette allows the bright color to be the true focus of the outfit, creating a bold, yet still relatively tame look. Obviously, you can choose any neon hue you want, but for this look we went with a basic lime green t-shirt. Pair the top with simple white cuffed shorts and add a pair of embellished sandals. Accessorize with a glitzy skull necklace, gold wraparound ring and retro-inspired sunglasses for a casual and stylish look for summer. You can also choose to downplay the neon in your look, meaning that rather than highlighting a bright neon piece with neutrals, you instead style it with other bold clothing and accessories. This makes the neon just one small element of the outfit, and when done right, can look super-trendy, but not at all over-the-top. 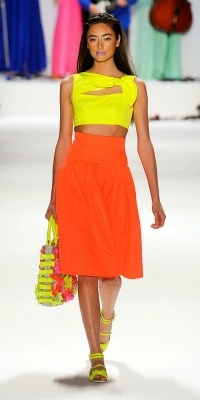 For example, try pairing a pleated neon orange skirt with a gorgeous printed tank top. Add a distressed denim vest and a pair of tan lace-up wedges. Accessorize with feathered earrings and a light blue, floral print bag. The colors found on the tank help to pull together all of the other elements, which creates a harmonious and not clashing look. Black and neon are total opposites in the color world, but they work so well when paired together. Wearing bright neon with sleek black clothing and accessories not only creates fantastic contrast, but also makes for a daring look that’s sure to get you noticed. The halter-neck dress above already has a bold black stripe down the back, which creates a great contrast against the highlighter yellow fabric. A pair of black ankle-cuff pumps and a matching chain-strap bag give this look a polished vibe, while several black and silver bracelets add some edge. Colorblocking has been big for a few seasons now, so naturally pairing one neon piece with another is a great way to wear this trend. Just keep the neon pieces solid-colored and brightly hued for a bold, yet chic look. For the final look, start by pairing a citron yellow blouse with a pair of neon blue shorts. A hot pink-trimmed handbag not only picks up on the color of the belt that comes with the shorts, but also makes these neutral-colored TOMS the perfect addition to the outfit. Accessorize with a black-and-white printed watch and simple stud earrings for a look that incorporates modern and classic elements. Would you wear neon? What do you think of this trend? Would you wear any of these outfits? Which one is your favorite? How would you wear neon? As always, remember to leave a comment below and tell us what you think!